This World tells the story of four Iraqi boys - who are both friends and class mates - at school in one of the most dangerous cities on earth, Baghdad. One boy is Kurdish, one Christian, one Shia and one from a mixed Sunni/Shia background. As the city is torn apart by sectarian violence, the film follows their friendships to see whether they can survive. 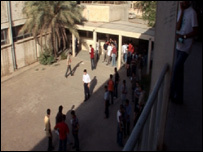 Filmed by the four students themselves during the 2006/07 academic year, The Boys from Baghdad High offers a unique insight into ordinary Iraqi lives. As the boys enter their last year in school, the strain of daily life does not really inspire them to study. And like lots of adolescent boys they prefer other distractions like texting girlfriends, playing computer games or learning the words to rap songs. But both the boys and their families have to make important decisions - like whether they want to stay in Baghdad or flee to safer areas as so many Iraqis have done. Some families struggle financially, whilst for others getting the necessary papers to own a passport becomes a huge ordeal. This World follows the boys as they take their final exams and look to the future.